Indoor 4x800 WR; Congrats to Eric on the first TrackTalk(er) WR! Boston, MA – What a race. Erik Sowinski, running anchor for the USA All-Star team, just managed to hold off Michael Rutt’s attempt to pass him on the inside to win the 4×800 at the New Balance Indoor Grand Prix in 7:13.11 as both teams (Rutt was running for the NY/NJ Track Club) broke the previous world record of 7:13.94. A battle to the line and a world record. It doesn’t get much better than that. This race was initially billed as a two team battle for the world record between Olympic Silver Medallist Nick Symmonds’, Brooks Beasts team, and the NY/NJ Track Club team presumably led by Robby Andrews. After a quick 600m race last month, Olympic 4th place finisher Duane Solomon decided to extend his indoor season and enter an “All Star” team into the field and the 4×800 became a three team battle. The four team members of the Brooks Beasts team entered the track wearing the trademark matching yellow headbands of Mark Wieczorek, or “Coach” as Nick Symmonds called the Brooks Beasts’ third leg. (Wieczorek was the coach of the Gig Harbor team that won the Nike Nationals High School National Championships this year.) The team was second strongest on paper, but had Symmonds on the anchor. Symmonds was never a factor in this one as Matt Scherer, the world’s preeminent 800m pacer, buried the Brooks team on the first leg by running an atrocious 1:54.6 split, nearly 5 full seconds behind the NY/NJ’s Kyle Merber who split 1:49.68 and was surprisingly a full second ahead of everyone else in the field. 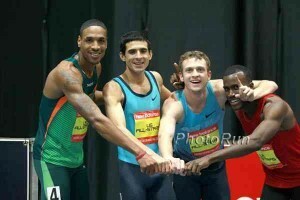 The NY/NJ “B” team was second (1:50.72) and in third was Richard Jones and the US All-Stars. Former Penn State star Cas Loxsom tried gallantly to get back the Brooks Beasts back in the race on leg two, as he ran the fastest split of all the second leg runners (1:47.03), but if you are five seconds down after leg one, it’s over. On leg two, David Torrence had the second fastest second leg (1:47.46) to get the US All-Stars right on the heels of NY/NJ (Brian Gagnon 1:48.59) at the end of leg two. This was now a two team race for the record. The All-Stars put their big gun on paper, Duane Solomon on the third leg, and he was matched up against former NCAA star Robby Andrews for NY/NJ. Solomon passed Andrews early, but Andrews held his own with Solomon on the final lap, and they handed off virtually together with Solomon (1:47.98) handing off just .11 ahead of Andrews (1:48.28). On the anchor, the All-Stars had American record holder at 600m, Erik Sowinski, running for them while NY/NJ put its hopes in the hands of Michael Rutt. It was an even match-up on paper. Sowinski set an indoor pr of 1:46.84 last week in Germany while Rutt had set an indoor pr of 1:46.71 yesterday at the Valentine’s Day Invite across town in Boston. Outdoors, their PRs also are similar as well. Rutt ran 1:45.08 last year and Sowinski 1:45.21. To get the world record Sowinski needed to run 1:47.50. Not impossible to do, but only one runner in the field (Cas Loxsom for Brooks on the second leg 1:47.03) had split that fast so far in the race. This one came down to the very end. Sowinski led wire to wire but Rutt stayed right on his heels. Entering the final straight away Sowinski drifted half a body length towards lane two. Rutt didn’t think he had enough energy left to go wide and believed his only chance was to stay on the rail and try to pass Sowinski on the inside of lane one. There might have not been room for Rutt to go by, but in the end no contact was made as Rutt just couldn’t quite catch Sowinski. Sowinski held Rutt off by just .11 as both men split identical 1:46.66. Was it fast enough for the and the world record? Yes. Sowinski (7:13.11) and Rutt (7:13.22) both broke the previous record of 7:13.94 was set by Joey Woody (now Sowinski’s coach), Karl Paranya, Rich Kenah, and David Krummenacker in 2000 on this same track. Splits, commentary and video below. Tremendous running by the anchors. World records are good, but a world record in a competitive race is even better. Erik Sowinski is coached by Joey Woody who was on the previous World Record team. We liked the fact Sowinski flew to Germany to take on some of the world’s best earlier this year. The world record guys rightfully got all the attention, but let’s not forget Michael Rutt. He PRd on Friday at the BU Valentine’s Invite, and then needed another PR type effort here to possibly get a world record, and he delivered. Rutt made the world indoor final two years ago, and making the US team for Worlds’ won’t be easy, but he’s starting off 2014 well. Matt Scherer sat with a dejected look in the mixed zone after the race. One of the world’s best pacers at 800m, he’s used to helping others run well. Today he was hoping to help his Brooks Beast team to the world record, but instead Scherer faded tremendously during the second 400 and ran 1:54.65. Definitely not what he wanted. Scherer was not making excuses afterwards but this was his first full 800 in a race since 2010. Scherer said he forgot mentally what it was like to race and was surprised how different it was than rabbiting. Holding people off on the turns, battling people for position, (and running the final 200) were all concepts Scherer had to try to re-learn today. Andrews dropped out of the mile at the New Balance Games in Boston two weeks ago, but ran a 1:47.07 pr yesterday (just missing the 1:47.00 world indoor standard), and followed that up today by being competitive with Duane Solomon. 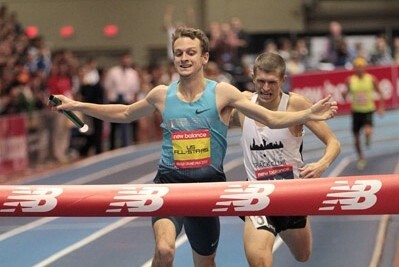 Andrews is happy with the way things are going during his first year with the NY/NJ track club (he used to be coached by Jason Vigilante) and will race Nick Symmonds next week in a 1000 at Millrose that is being billed as an American record attempt. Neither guy has the 800 World Championship standard but that will have to be hit at USAs. Solomon became a father for the first time in December and is not going to extend his indoor season any further. A world record is a pretty good ending point. Speaking of records, Solomon told us his goal for outdoors is to try to get the American record in the open 800. Ideally, he said he’d like to do it on American soil at the Prefontaine Classic. Richard Jones is the least well-known of the 4×800 record holders but has been training with Duane Solomon since 2012. He introduces himself to LRC Nation below and talks about the race. Torrence is known for having tremendous range from 800-5000. Solid at whatever he does, that seems like the perfect guy to put on an all-star team when you need a good leg and Torrence delivered. Fans love to root for teams. The Olympics are the most popular thing in track as fans have teams to root for – Team USA, Kenya, etc. Rarely do you get that in track and field. Maybe if the club system in the US takes off, races like this will be common. I thought he really hung in there and looked good doing it. I would suspect he goes under AR at 1000M, whether he winds up being the holder of it after the race is run?? We shall see. Textbook final straight for Erik. Erik ran the final straight perfectly covering the outer half of lane one. Rutt spends time figuring out if he can get through-- because it’s so inviting - but might not be enough room… and we are at the line. Frank Gagliano is a wise man The NJNY group-Gag’s Gang in my book- is coming along They had two more members go sub 4 for the mile and the women group seem to be turning in performance that get better week by week. Yesterday was a great day for the fans-- a really fun meet and Erik and Kyle represented well. Let’s hope Kyle stays healthy I feel he has the tools to put together a series of PRs in the 1:45.x ,3:34.x,(currently 3;34.54) 3:50-51 and 8:17 neighborhood. Yup up there in “Marty Guitar” territory time wise. Agree on these points. Nice work by Robby. In the right direction. I expect he will win at Millrose and likely will set a new AR in the process. Let’s hope Kyle stays healthy I feel he has the tools to put together a series of PRs in the 1:45.x ,3:34.x, 3:50-51 and 8:17 neighborhood. Yup up there in “Marty Guitar” territory time wise. If he ran that for 2M i would eat my hat. Has he even come close to breaking 8 for even 3k? Can you guys enlighten me on what you’re seeing that makes you so optimistic for the 1000 AR? I’m not saying he can’t and I agree he’s looked about 85% better these last two races, but there are a number of guys who were running as fast or faster that didn’t get the 1K AR. I understand that the 1000 is his sweet spot and all, but I just see the AR as less likely than you do. Don’t misunderstand; I’m not bad mouthing him or anything, but I feel like I must be missing something. Zat, apparently he ran slower at this point last year and still just missed the AR by .04. I think that’s what they’re trying to get at. im guessing he is referring to steeple, which is the only thing that possibly makes sense to me and even that i dont see. I think there is a natural tendency to over-inflate what he is capable of just because he posted here frequently back in the day. Using that methodology, you are going sub 350y this year easily. What about Symmonds for the AR? Isn’t he going for it in the same race? Gotcha. I’d completely forgotten that he got that close last year. My opinion may not prove correct but I hold that Merber- given a run of good health & solid training- can run a sub 8:20 two mile. Merber and I have spoken about the depth and intricacies of the problems that have kept him sub-par or injured the past couple of seasons and that knowledge is reflected in my projections. …agree of course everyone tends to look on the up side of things concerning friends but I do not think that my thoughts are too,too Pollyannaish. As far as projecting state013’s 2014 potential— again I have a bit of backfence conversation that makes me keep my thoughts in camera. I’m not betting the farm on it. Simply looking at year over year, then factoring in the fact that this is Andrews’ best distance. He seems to be rounding into shape at this point in the season. I’m guessing that his fitness will only improve. 2:17.86 is very reachable IMO. I am a Merber fan, but wineturtle, you must be a relative? Best wishes to Kyle, but those kind of expectations are as unfair as they would be illogical, on data so far, I have no idea where you draw this stuff uo from? I may well be overreaching - in real life I’m on a very optimistic roll right now I guess. Lots of better than expected outcomes recently might make me forget I’ve chosen to view the world thru rose colored glasses. He does have a 3:35,6 in the bank Let’s be fairer to him and say up side is 3:53 mile and a 8;23/4. I do think he has a bit more speed endurance to tap. Purdy looks at 3:35 mid as 3:53.5y- 8:23y at same level of excellence. what can you expect from a former slow sprinter?